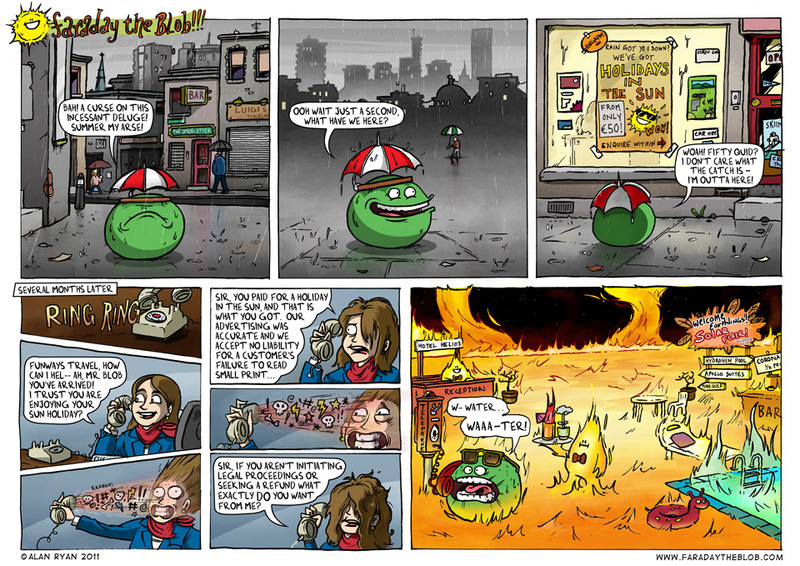 This entry was posted on Wednesday, July 6th, 2011 at 11:20 pm and is filed under Comics. You can follow any responses to this entry through the RSS 2.0 feed. You can skip to the end and leave a response. Pinging is currently not allowed. heh heh corona half price.. nice. I had my own fire waiter once. I also had a house once. “inituting”???? Should that be initiating? Inituting sounds like a word to describe an internal fart. Brad - Oooh fancy – but did you have a hatbrella? Bearman - Intooting, a dangerous trick… It actually does say initiating – it’s just that my home-made font doesn’t work so well with some letter combos :/ I’ll see if I can make it a bit clearer. I DID… it got allll burnt up. funways girl could be mistaken for ryanair spokesperson.have they an arrangement? Mick - They’re all part of the same sinister umbrella organisation. Aoife - I know right? I mean this breakfast may be free, but these are not real cornflakes. Tsk. Faraday has every reason to complain; he was promised a holiday ‘in’ the sun, there he is ‘on’ the sun. Everyone knows there are some lovely lava beaches in the sun, but that the surface is terrible. Used condoms everywhere, old needles… and way too hot. He’s 1000km inside the photosphere; it’s like if he was to go on holiday to say, Canada, while he would be ‘in’ Canada, wouldn’t he would technically be ‘on’ Canada also? I know, the surface of the sun is disgusting. Something oughta be done. Glad to hear he’s in the photosphere, but I must correct your English, my Gaelic-speaking friend: One does not ‘holiday’ in Canada the way one would ‘holiday’ in Ireland (and a lovely holiday it would be, Jill Ireland was a cutie). One ‘experiences’ Canada, as in ‘Where are you?’ ‘Oh, I am currently experiencing Canada’. Alternatively, you can say ‘Having my mind blown by Canada’, or if you wish to speak in the familiar, you could simply say ‘HHHOOOOCCKKKEEYY! !’, and the listener would instantly know your location. diggin the 2nd panel with the muted grays and how you make it look slick from the rain.